Details and RSVP info for my upcoming webinar with the amazing Shannon Gregg! 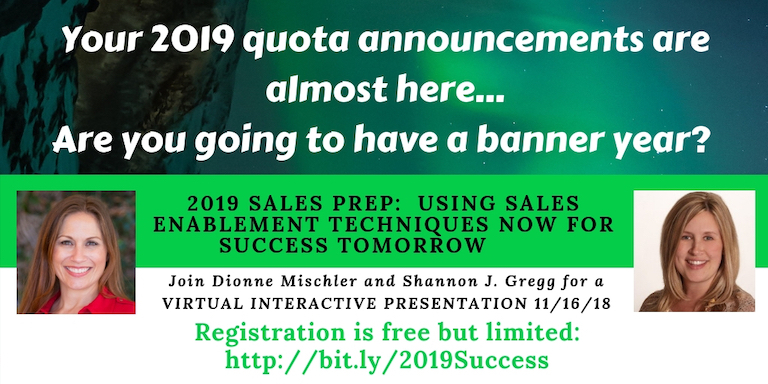 I’m pleased to announce that tomorrow I’ll be joining sales operations and enablement expert Shannon J. Gregg for an interactive virtual presentation on how to equip and enable your sales team to crush your 2019 revenue goals. How to choose the right tools to enable your sales team. How to refine your process and KPIs to achieve success. How to create systems of consistency and accountability for your reps.
How to recruit and retain A-players for your sales organization. The webinar starts on Friday, November 16th at 12pm EST. There is limited availability to attend, so sign up here.